We invite you to explore India - the Land with infinite beauty ! Whether you soar high into Himalayas or peer under the ruins of the Ancient monuments dotting the landscape of India, you will cherish the experience long after your visit ! 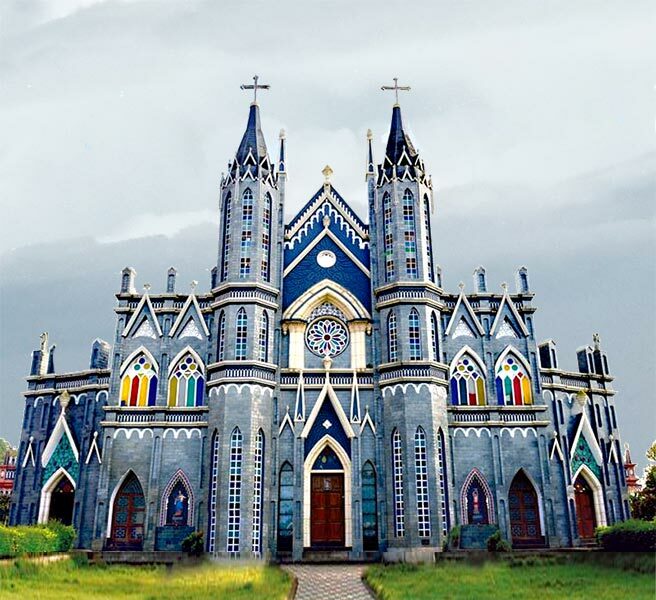 This India Travel Guide on St.Lawrence Basilica in Attur is free from any commercial interest! This site is dedicated to promote India - the vast subcontinent, its glorious past, magnificent landscape and its infinite variety. History of the Shrine: St.Lawrence church or Sao Lawrence near Karkal in the Udupi district of Karnataka was probably built by the Portuguese some time in 1700s. The Portuguese built church was in honor of the 3rd Century Saint St.Lawrence who was martyred under the waning Roman empire. Saint Lawrence chose death as he supported the poor, homeless, orphans, destitute and all those who suffered from disease and penury. He became the patron Saint of the downtrodden, the oppressed and the persecuted. This small church was one of the many churches razed to the ground by Tippu Sultan during his period of persecution of Christians in Canara region from 1784 to 1799 AD. When the Christians eventually returned to their lands, they housed the statue of the St.Lawrence under a thatched roof. Slowly the church became a source of solace because of the Saint. The small church soon was rebuilt and again rebuilt as it became a place of pilgrimage. During the feast time in January, the pilgrims swell in large numbers. Many miracles have been attributed to Saint Lawrence in this sleepy town of Attur. Increasing number of pilgrims from all over South India and the sustained efforts of the faithful - eventually resulted in the papal declaration of this Shrine into a minor Basilica - the 22nd in India. Pope Francis issued the Papal decree in May 2016. The feast of consecretion was celebrated on the 1st of August 2016. The occasion was graced by HE Oswald Cardinal Gracias Archbishop of Mumbai, HE Baselious Cardinal Cleemis Major Archbishop Catholicos of the Syro Malankara Catholic Church, Trivandrum, Mar George Cardinal Alencherry, Major Archbishop of the Syro Malabar Catholic Church Ernakulam, Most Rev Dr Bernard Moras Archbishop of Bengaluru, Aloysius P D'Souza, Bishop of Mangaluru diocese, Rev Dr Gerald Isaac Lobo, Bishop of Udupi Diocese, Msgr Baptist Menezes Vicar General Udupi Diocese, Fr George D'Souza Rector of St Lawrence shrine, many bishops and priests. St.Lawrence Shrine: The Church - grey in color has 2 tall spires. There is a small hill known as Parpale hill where a Cross has been erected. Pilgrims climb this hill to pray before the Cross and it has been decreed that those who pray before the cross with one 'Our Father', one 'Hail Mary' and one 'Glory be' will be granted 50 days indulgence. Directions: Saint Lawrence Church is about 58 km from Mangalore via National Highway 66 up to Padubidri and then in State Highway 1 and about 370 km from Bangalore. In the tradition of this region of Karnataka, free Vegetarian meal will be served in the Church dining hall for all on Thursday after the Novena.